Paige Stringer, '96, really knows how to pack her bags. What began as a freelance article on customized vacations quickly spurred the creation of a nonprofit foundation—The Global Foundation for Children With Hearing Loss—and earned her hearing aid manufacturer Oticon, Inc.'s 2009 Focus on People Award for her advocacy efforts. 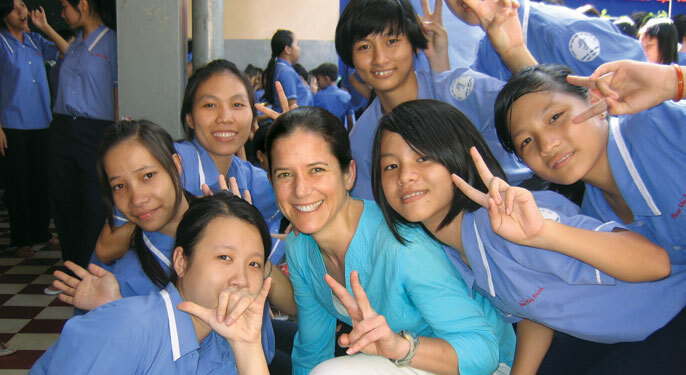 A 2008 trip to Vietnam through Buffalo Tours' Volunteer and Educational Group Travel included a provocative stay at the Thuan An Center for the Hearing Impaired. This experience, along with subsequent travel in Southeast Asia, illustrated for Stringer how limited teacher training, shortage of quality hearing aids and general lack of awareness about hearing loss was having a detrimental effect on the livelihoods of thousands of deaf and hard-of-hearing children. She was determined to do something to raise the standard of education available to deaf children in developing countries to a higher level—the level she received early in life. Born profoundly hard of hearing, Stringer was mainstreamed in kindergarten thanks to early identification, expert teachers and hearing aids. She succeeded alongside her hearing peers and attended the UW on a tennis scholarship. After graduation, she logged 12 years in corporate marketing at Fortune 500 companies before becoming an independent marketing consultant and writer for the travel industry. As founder and executive director of The Global Foundation for Children With Hearing Loss, Stringer has assembled a board of medical and business leaders—including three from the UW Department of Speech and Hearing Sciences—and built a platform to extend teacher training, deliver hearing aids, and improve outreach about hearing loss issues to communities in developing countries. Early on the foundation began collaborating with the Thuan An Center to host a month-long workshop this summer that will bring 15 American experts in audiology, speech-language pathology, early intervention and auditory-verbal education to train 85 Vietnamese teachers of the deaf and hard of hearing. The purpose: Arm these teachers with the knowledge they need to help children with hearing loss develop oral communication and listening skills during the critical period of language development that occurs in the first six years of life. If the model succeeds, the plan is to move on to other countries, such as Cambodia and Nepal. Given Stringer's track record of defying stigmas, success seems likely. During her time in Vietnam, some were so impressed by her spoken language ability they did not accept the severity of her hearing loss until she took a hearing test. "It was the first time in my life that I was actually happy to have registered so horribly on an audiogram," she says. Already Stringer has given hope standards can be raised for the thousands of deaf and hard of hearing children in developing countries. Thanks to her efforts, a framework is being developed, as she says, "�to set these children on a path to achieve their full potential." —Paul Fontana is the UWAA's virtual media editor.